In the wake of the recent, somewhat unseasonal, downpours in the runup to Midsummer’s Day, the going around the country has been changed to include the terms “Soft” and “Heavy”. In the case of Leicester, we can add “Abandonned: Waterlogged”. Such unseasonal changes are always liable to mess with the form book. One of the tasks of the form student is to establish what previous form, if any, has been shown on such going. In Smartform, we can translate this into a query on any particular runner, in order to find all its previous runs on similar going. By way of example, we’ll pick a race at Sandown today, since it is currently supposed to be riding “Soft, Heavy in places”. 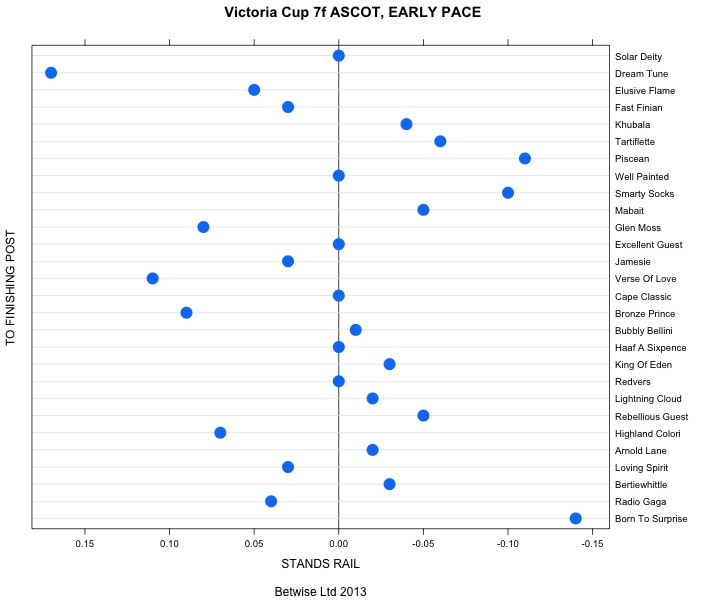 The race we’ll look at is the 2.50 at Sandown, a handicap over one mile. Smartform subscribers can try this one at home, since the table of results is rather wide to reprint in the blog (of course we can include any of the variables available in Smartform within the returned results, this just shows us the most pertinent basic information in order to see if Leviathan has shown any promise on softer going). If we had wanted just to cut to the chase and see runs only containing the terms “Heavy” we could have altered the query with a condition for the going description. This time, only one result is returned. A second out of 4 runners in a recent race over course and distance. The horse appeared to handle the going, being beaten only narrowly. However, we’ll find that it’s quite rare that horses have had many runs on heavy going, so that most queries which restrict results to runs only including the term “Heavy” on these runners will produce the results “Empty Set” (as with Leviathan). Where a run is returned, as in the case of Sam Sharp above, the sample size is usually so small that even if the run was not good, it is hard to say that the horse did not act on the going. We can say the reverse, however, where the performance in a run has indicated that a horse acted on the going. Producing an individual query such as the above for each runner in a race is somewhat tedious of course, so this is exactly the type of query that can be automated for a whole race, dispalying all runners’ previous performances on heavy, for example, in one move, using a simple programming language, such as R or Perl. For some examples of using R with Smartform in this way, see the last Chapter of our free ebook, “BetfaiR Trading with R”. Welcome to the Flat 2012! There’s been a break from the blog this winter, but it’s now time to get back into it with the start of the Flat. Given a race as rich as the Dubai World Cup today it seems a bit traditionalist to herald the start of the Flat with an analysis of the Lincoln Handicap, but that’s just what we’re going to do. We wrote about Lincoln trends this time last year and not much has changed in that there is only one more year to add. Notice that specifying race_name LIKE “%Lincoln%” alone (in other words retrieving all races that meet the condition of containing the word “Lincoln”) throws up many false positives, including lots of Lincoln trial races. A little lateral thinking goes a long way when working with horseracing data – here we’ve simply added the qualifying criteria that prize money must be over 75k and hey presto we get the Lincoln winners’ summary details for every year in the database, including 2006 and 2007, the years when the Lincoln was run at Redcar and Newcastle respectively. What trends can we see? Well, many similar to the ones we found last year, of course. Except that one of the stronger trends we identified just by looking at the winners was that 4 year olds had dominated the winners podium – and last year a six year old won it. Let’s examine this trend a little more closely, since it’s rightly pointed out that winner trends can be misleading without considering the whole data. In other words, the statistic that 4 year olds have won the last 6 out of 9 runnings (ie. two thirds of recent renewals) would be meaningless if the number of 4 year olds running as a proportion of the whole field had also been approximately two thirds over the past 9 years. Let’s turn to Smartform again to analyse this. What we’re looking for is the distribution of runner ages for all runners in the Lincoln over the past 5 years – how many were 4 year olds, 5 year olds and so on, and what proportion did these represent of the total. Now, how were those runners distributed by age? What conclusions can we draw from this? Does the data support the theory that 4 year olds are showing a high win ratio over the past 9 years? Very much so – despite representing only 65 of the 208 Lincoln runners (so just under one third), they have produced two thirds of the winners. What other trends look worth investigating further from our original query? Plenty, but let’s focus on one other – trainer. In the last 9 runnings, two trainers have won the race more than once – Mark Tompkins and William Haggas. 2 winners out of 3 runners. Not bad… William Haggas also trained High Low to win the Lincoln in 1992, before Smartform records begin. So he certainly knows how to train the winner of this race. What 4 year olds are running in this year’s renewal, and who are their trainers? For this we turn to the automatically updated daily_race and daily_runner tables. We get a Haggas runner thrown in for free… Fury, Haggas’ runner this year, is at the time of writing vying for favourtism in this year’s renewal. The trends show us why Fury is near favourite. By the way, another trend worthy of note is that horses at the top of the market have started performing very well in recent years (as you can see in the decimal SP column of the original query table). Personally, I find it hard to back 6 /1 shots in competitive cavalry charge handicaps, and would sooner be backing something available in double figures, but historic trends suggest this one has every chance. 1 mile 6 furlongs is an unusual trip as a percentage of the grand total of flat racing handicap distances. Race analysis can often underestimate the additional stamina requirements which are needed to win at it. There is not complete ignorance, but it’s typical to see analysis that supposes that horses that perform well over the more common trip of a mile and a half may be suited by the way in which they have run their races to perform well at the 2 furlong longer distance. Of course they should also go a decent pace in the Ebor, which, with a big field, makes it a true test over the distance.